Hi everyone! This is a such a fun month for Waffle Flower! Not only are we rolling out the fun April release, but we're also highlighting the Creativation products! For our April release, we have a sentiment set called Be Her Sentiments (stamp) to go with our popular Be Her (stamp, die, combo) and Be Him (stamp, die, combo) sets. We also have Bold Sentiments (stamp, die, combo) that is great for graphic cards. Grateful (stamp, die, combo) is our take on Mother's Day projects for 2019 with some warm hand drawn kitchen items. Did you know that Waffle Flower will be 5 years old this month? It's no wonder we have birthdays on our mind! 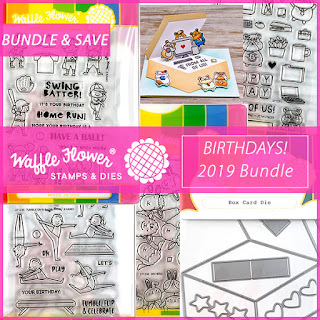 Over the years Waffle Flower has had a variety of floral birthday sets, so this time we've expanded on the birthday theme with some fun and special occasion birthday stamps and dies this time! And of course, we've got lots of other fun stuff too! April marks the beginning of baseball season and we are ready to hit one out of the park with the fun Batter stamp (stamp, die, combo). We've also got the sweetest gymnasts partying with flips in Tumble On (stamp, die, combo). For the birthday theme, we have the cutest hamsters celebrating their co-workers in Office Birthday (stamp, die, combo). 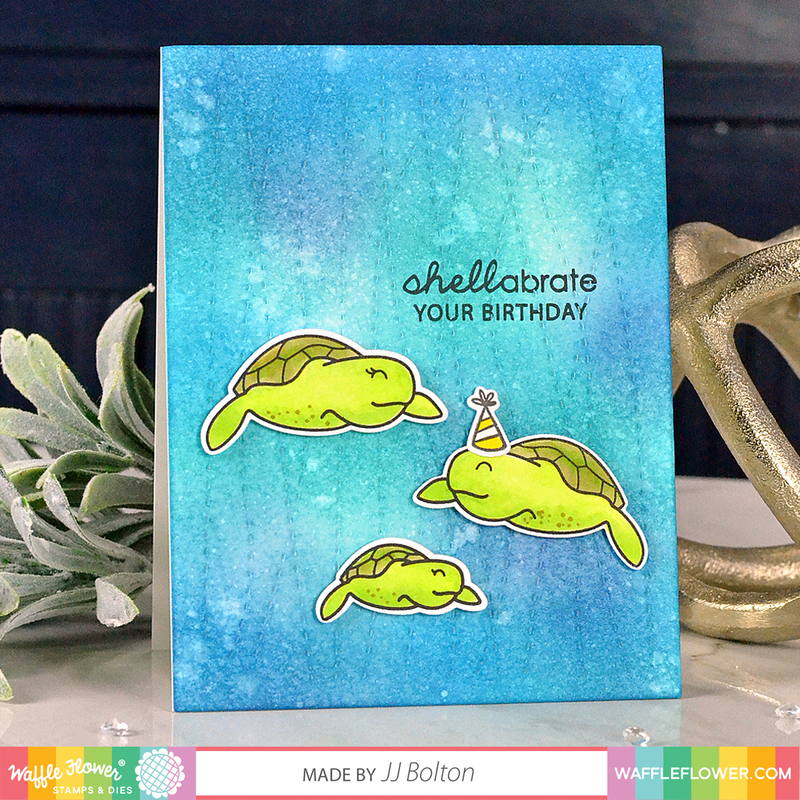 The We Herd (stamp, die, combo) is a reminder that when it comes to birthday parties, the more the merrier! 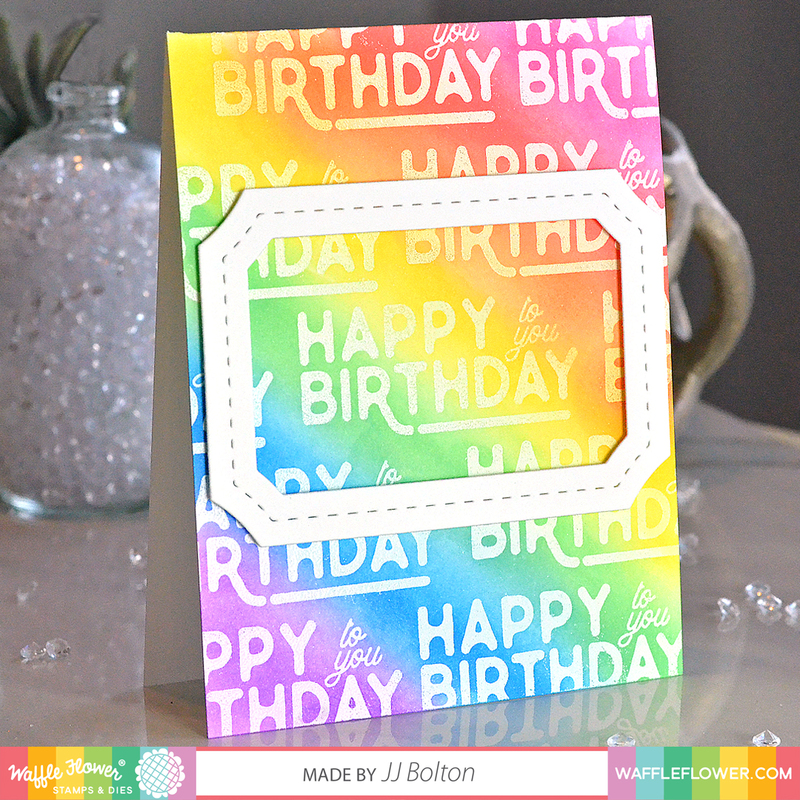 For die lovers, there's the Box Card Die that is an interactive way to give a birthday surprise right on the card (this is one of my faves this month)! Every year Waffle Flower releases several Back to Basics dies. Usually they are simple, nesting shapes that can be used as mattes, accents or even card bases. This year we have the A2 Layers and A7 Layers dies for clean and timeless rectangle dies that will be a staple in your stash. For those who like fun shaped cards, layering shapes or paper crafting projects, we have the Speech Bubbles and Nesting Hearts dies. You can never have too many frame dies! So this year we added the Picture Frames and Ticket Frames dies. Last but not least, Waffle Flower has a special set for animal lovers. 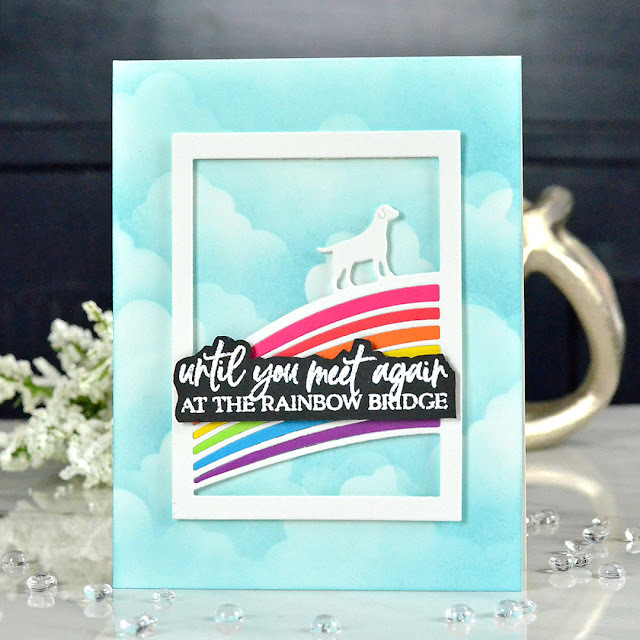 (This is one of my designs:) I designed the Rainbow Bridge (stamp, dog die, cat die, combo) sets to create messages of comfort to friends and family who have lost their beloved pet. This is going to be a whopper today, so let's get to the cards! My first set of cards uses a die and stamp set I designed for Creativation called Rainbow Bridge. Sometimes its the cards of comfort that mean the most when they are handmade. We are a family of animal lovers and we have lots of friends with furry family members, so this design is close to my heart. For those who don't know the story of the rainbow bridge, it tells us of a peaceful and happy place where pets who have passed away await to be reunited with their owner. When they meet again at the rainbow bridge, they cross together never to be separated again. I designed two dies and a coordinating stamp set for Rainbow Bridge. This first card uses the cat version. 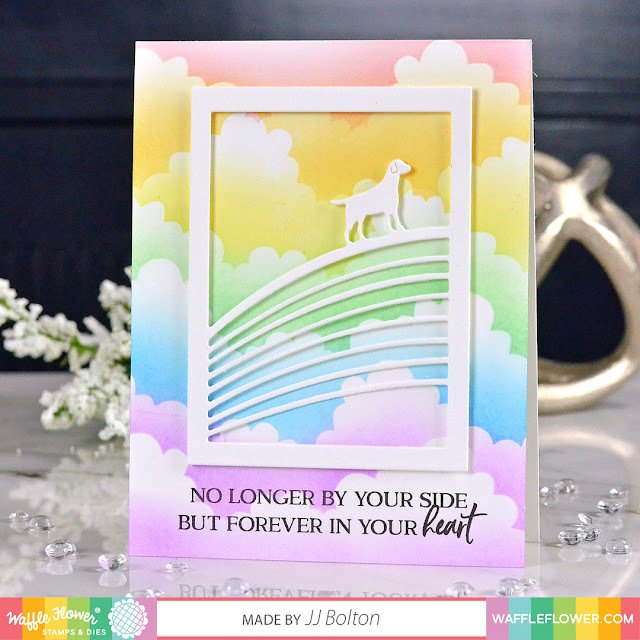 I'm going to show you a couple ways you can create the rainbow for this card. This first one just has strips of rainbow paper behind the die cut. For this version, I used the dog version of the die and inlaid the rainbow pieces that were cut from colored paper. You could also die cut white paper and color the rainbow pieces with pens or paint. 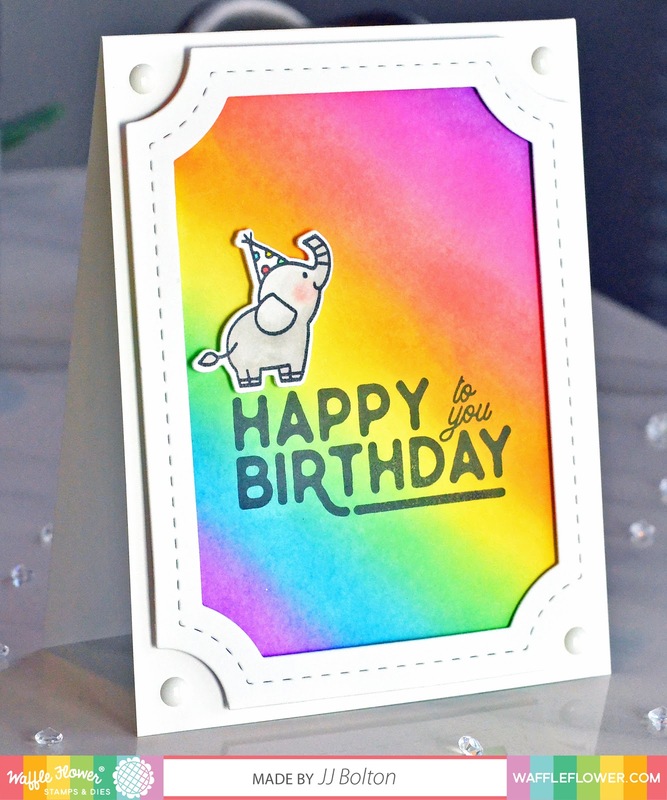 This last version is made with a simple cloud stencil and Distress Oxide inks in a rainbow spectrum. You never really want to have to send a card like this, but I hope that it will give friends and loved ones some comfort in such a difficult time. The next set of cards highlights another stamp and die set I designed called Bold Sentiments (stamp, die, combo). I really wanted to do some sentiments with a fresh and graphic feel, and this is what happened;)! As the name says, these sentiments are BOLD which means they work great with colored backgrounds made with Distress Inks and alcohol inks. For this card, I heat embossed the sentiment and then used Distress Oxide inks to blend a rainbow background. I used one of the Ticket Frames dies to highlight one of the sentiments. So, so easy but packs a punch! 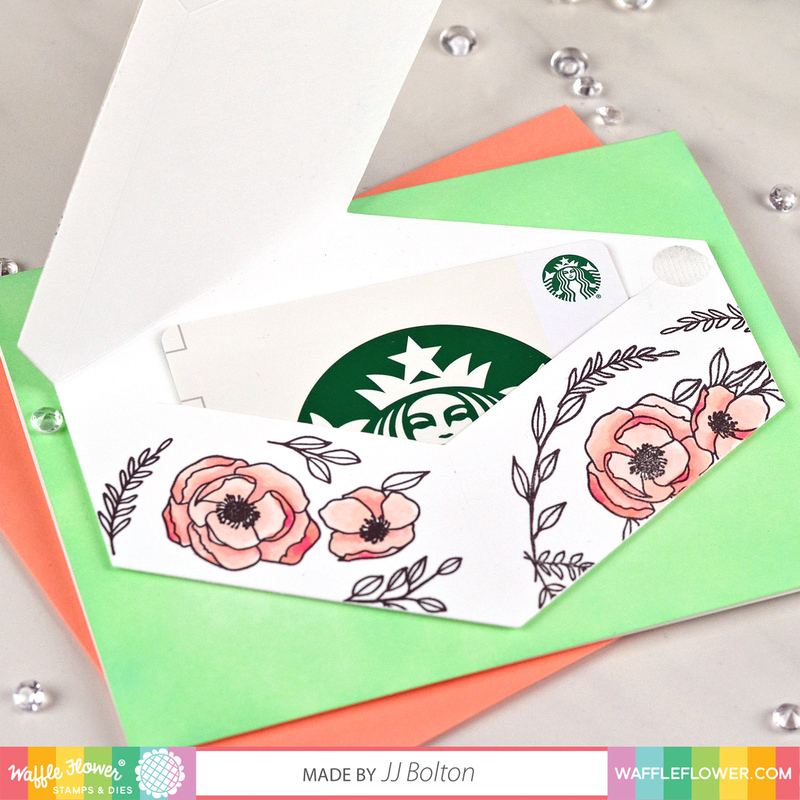 For this next card, I paired one of the Bold Sentiments with the Box Card Die to make a gift card holder. The more that I use the Box Card die, the more I love it! It is an interactive die cut that you can open up to reveal a popup, sentiment, or in my case, a gift card. I decorated my gift box with some floral stamps from the Be.You.Tiful set that came out earlier this year. The die cuts a slit inside that perfectly fits a gift card like this. For my last card, I used one of the Bold Sentiments and the large Ticket Frames die to make another rainbow card. I blended a rainbow background with Distress Oxide inks and then stamped over it with the sentiment. A couple white enamel dots and a little die cut elephant, and we're done! Whew! Thanks so much for stopping by! Here's a list of everyone hopping today and you don't want to miss any of the amazing release projects! To celebrate the blog hop, Waffle Flower is giving away $25 gift certificates to THREE lucky winners. You can leave comment on my blog and along the hop by 11:59pm ET on 4/7/19 for your chances to win. Winners will be chosen at random from the comments left on any of the posts on this blog hop and will be announced on the Waffle Flower blog on 4/9/19. Customers will receive a FREE Mini Egg Die with orders at $50 or over. Limited 1 per customer, while supplies last (valid through midnight 4/7/19). Hi everyone! 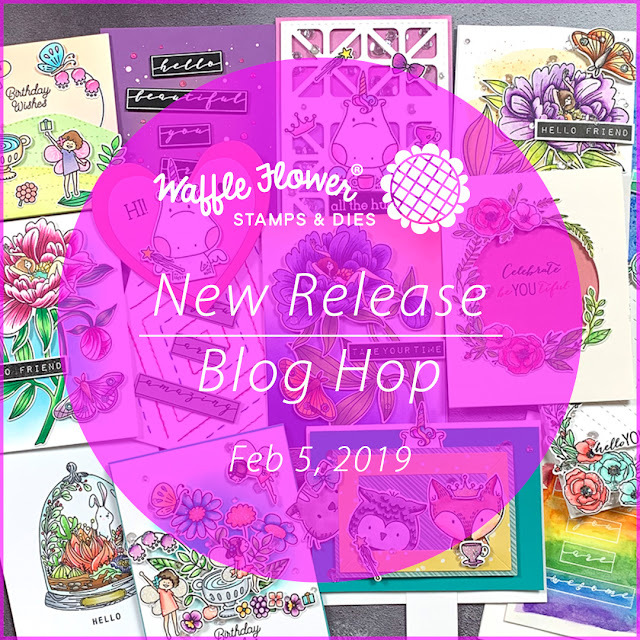 We are so excited to announce the arrival of Waffle Flower’s March 2019 release! This month there are 5 new stamps and 7 dies. So many goodies! We have the lovely Lilac Dreams set (stamp, die, combo) illustrated by Oana Befort which brings to mind summer breezes and sweet scented flowers. We also have a new Bouquet Builder set featuring a beautifully arranged bouquet of wildflowers illustrated by Karla Jodoin (stamp, die, combo). The pretty floral elements from our Loved stamp set is now back in a much bolder format in XOXO (stamp, die, combo). To compliment the adorable Be Her stamp set, we now have a dapper Be Him set (stamp, die, combo)! 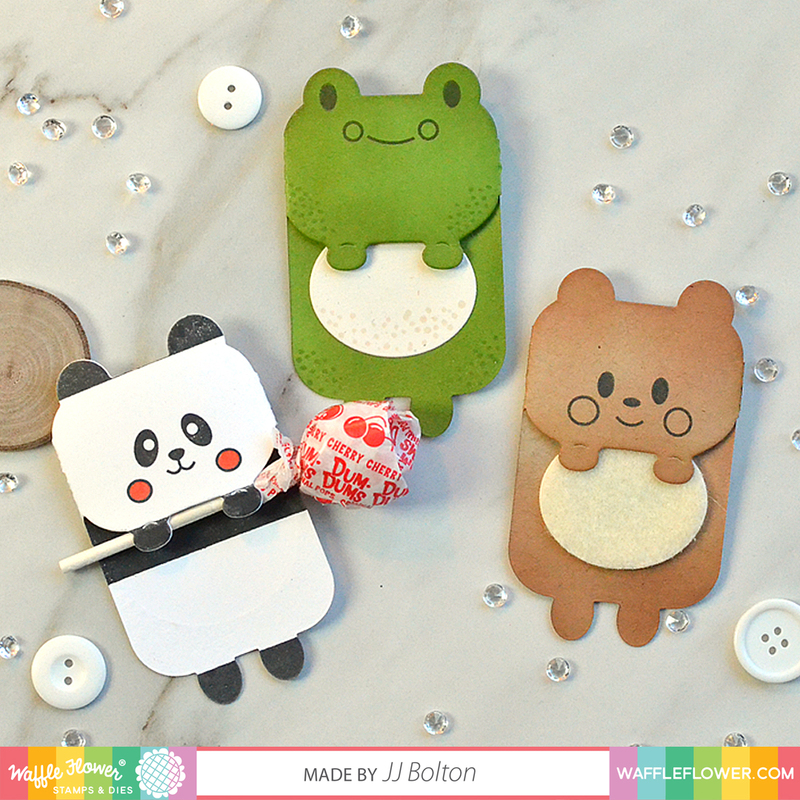 There is the new Animal Tags set (this one is from me:) (stamp, die, combo) which can be customized to create the cutest bear, panda, or frog tags. To round out the release, there are also two stand alone dies. The Stitched Rose (stand alone die) die allows you to add the look of beautiful stitching to a card in the shape of a pretty rose. 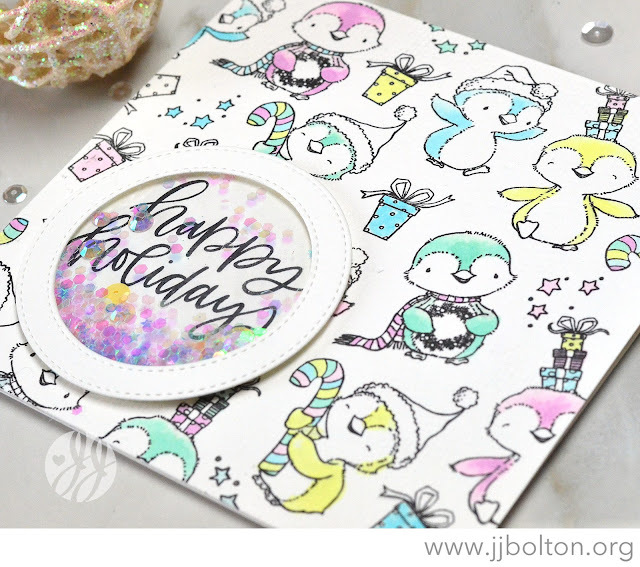 The Wave Texture Die (stand alone die) incorporates fluid stitched lines that are reminiscent of rolling waves, falling rain, or gentle winds (this one is from me too!). I have quite a few projects to share today, so let's get to it! 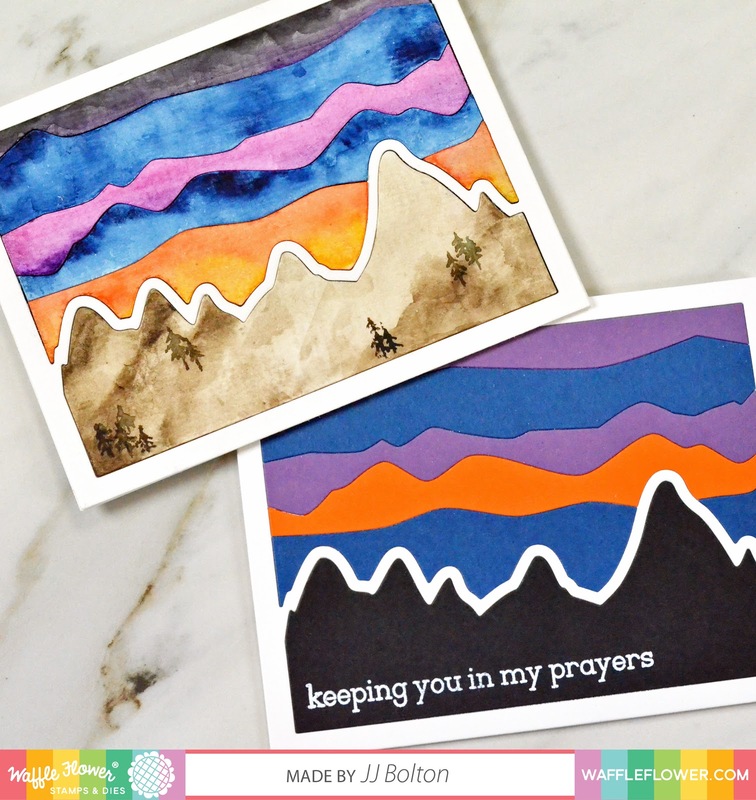 My first two cards show two different and easy ways to use the Wave Texture die. I made a little underwater scene with the cute turtles from the Shellabrate set on top of a panel blended with all kinds of blue Distress Inks. The stitching is subtle but it does give that feeling of flowing water or even bubbles, doesn't it? For this next card, the stitching is not subtle at all. A couple weeks ago, I colored another Texture Panel with Copics and I just loved how it looked! (Go check out my IG feed @ribbongirls to see what I'm talking about). So I tried it again with the Wave Texture Die, and here's the result! I thought the fun, pastel background would go perfectly with the unicorn from the Be Her set from last month. I really had a lot of fun coloring this one! This release I also made some cards using the new Animal Tags die and stamps. This single die cuts a card that folds in half to make a fun animal-shaped tag. 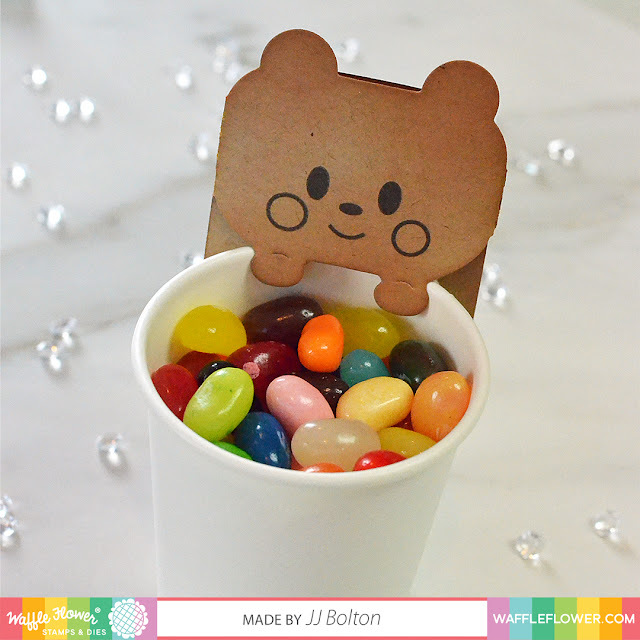 Depending on the stamps you use, you can make a panda, frog, or bear. When the tag is folded, you can use the paws to hold something like a lollipop (like I did above) or to hang the tag (like I did below). Below, I just attached the tag to the side of a little favor cup filled with candy. Here's a pic of the tag opened up. There is a tab and slot to keep the tag closed, so you can write a little hidden message inside. This die is great for gift tags, party favors, Valentine's, and lunchbox notes. Which animal do you like best? That's it for me today! I'm so happy that you stopped by! I'm the last one in the hop, but if you just jumped in, here's the list of everyone hopping today! You don't want to miss any of the amazing release projects. I have a ton of stuff to share today, so bear with me! 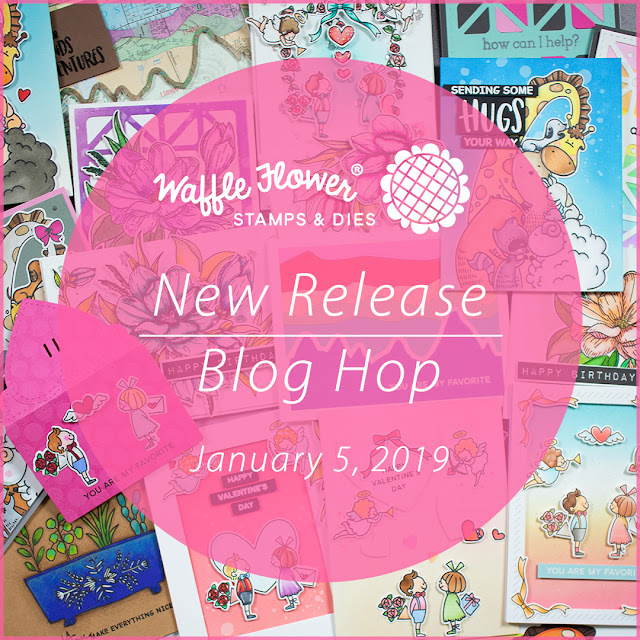 I am so excited because this is my first release hop with the Waffle Flower design team And there is so much goodness coming your way from Waffle Flower (I wish I could tell you EVERYTHING) and it starts today with the January 2019 release! 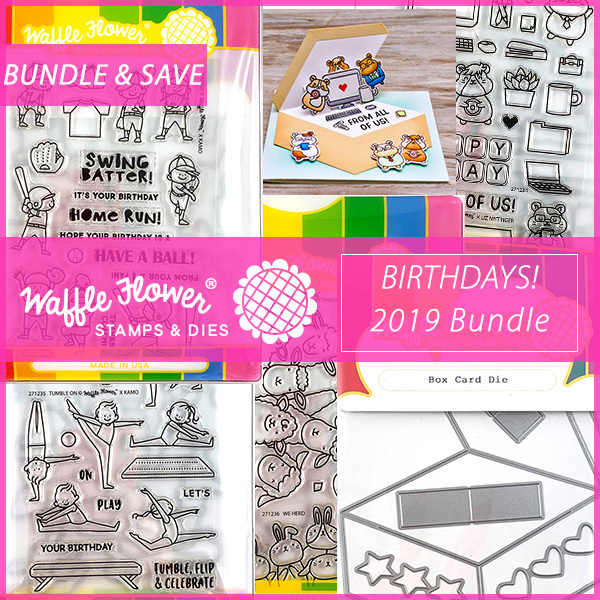 Did you know that starting with this release, Waffle Flower die sets will come de-tabbed and pre-arranged on magnet storage sheets? (Dies smaller than 4"X4" will be adhered to a backer card with tape) All you avid die fans know what a game changer this is! Also new this release, enamel dots have been added to the Waffle Flower line! The sets are designed for cardmakers and include lots of the tiny dots that cardmakers love! In this release, there are 3 different designs of enamel dots. The Clean & Clear set includes both white and clear dots, perfect for adding dimension and shine to any color combination. 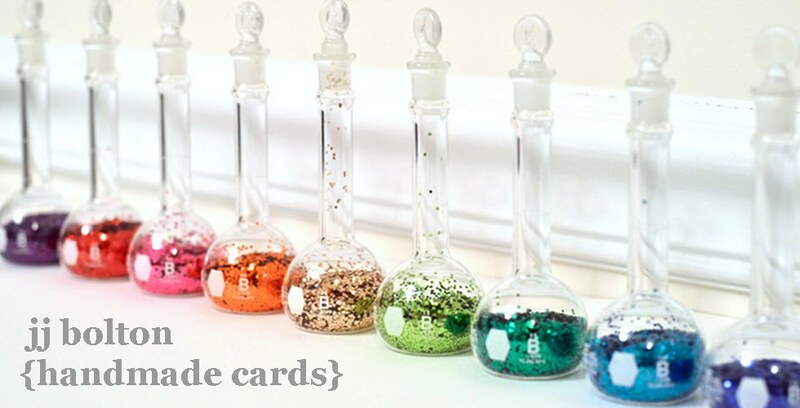 The Stardust set includes white and silver glitter dots. And the Up & Running set features 7 colors of dots from the rainbow of Waffle Flower ink colors. Check them out in the ink section of the Waffle Flower website. So now on to the stamps and dies:) This month, we have 5 new stamp sets and 7 dies. There is the Magnolia set (stamp, die, combo), illustrated by Karla Jodoin, with elegant, oversized flowers. You'll see lots more beautiful designs from Karla in the future! This set is perfect for coloring, and the exquisite details of these stamps make it easy for even beginners to enjoy. Also in this release you will find the sweet Group Hug set (stamp, die, combo) illustrated by Big Bear & Bird. This set is guaranteed to give you a warm and fuzzy feeling. In this release, there is also a sentiment set from a new Waffle Flower designer, me! 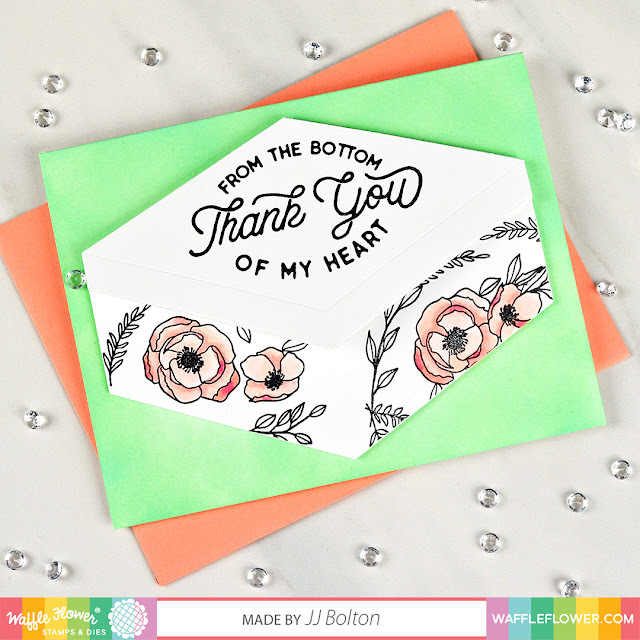 I designed the Here for You set with all the sentiments you may need to send a heartfelt message to a friend in their time of need. This set works with two standalone dies that I also designed (we'll talk about those in a minute). 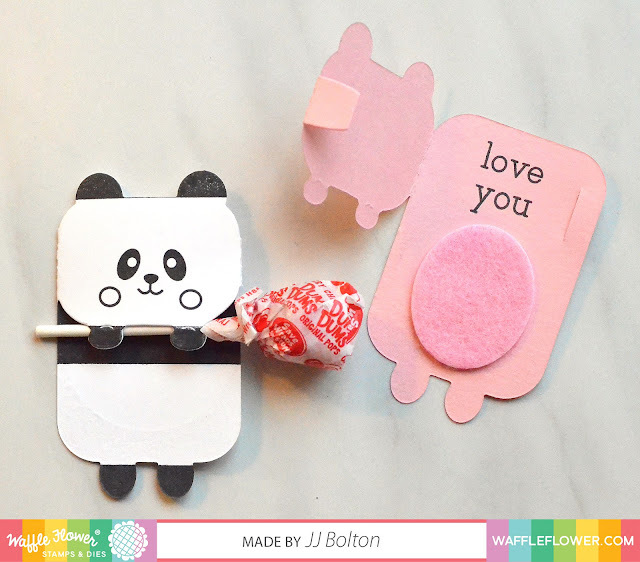 Another set in the release is Favorite Valentine (stamp, die, combo), illustrated by Kamo, and is just perfect for creating valentines for the classroom or your favorite little ones. To round out the release, we also have a 3"X4" stamp set, Spice Pot, for quick and easy cards. Along with the stamp sets, there are a couple of standalone dies this month. The first die is the Tile Panel die. This one is a 4" X 5.25" panel die with a classic, modern pattern that can be used for both feminine and masculine cards. Great for either a focal point or a background piece. The second die is named the Painted Landscape die. This unique, one-piece die makes it easy to create colorful mountain landscape scenes with depth and texture, all in one layer! Today, I want to share just a few cards using the Tile Panel die and the Painted Landscape die with the Here for You stamp set. The first card uses the Tile Panel die and could not have been easier. I just backed my die cut with a background made with alcohol inks on Yupo paper. 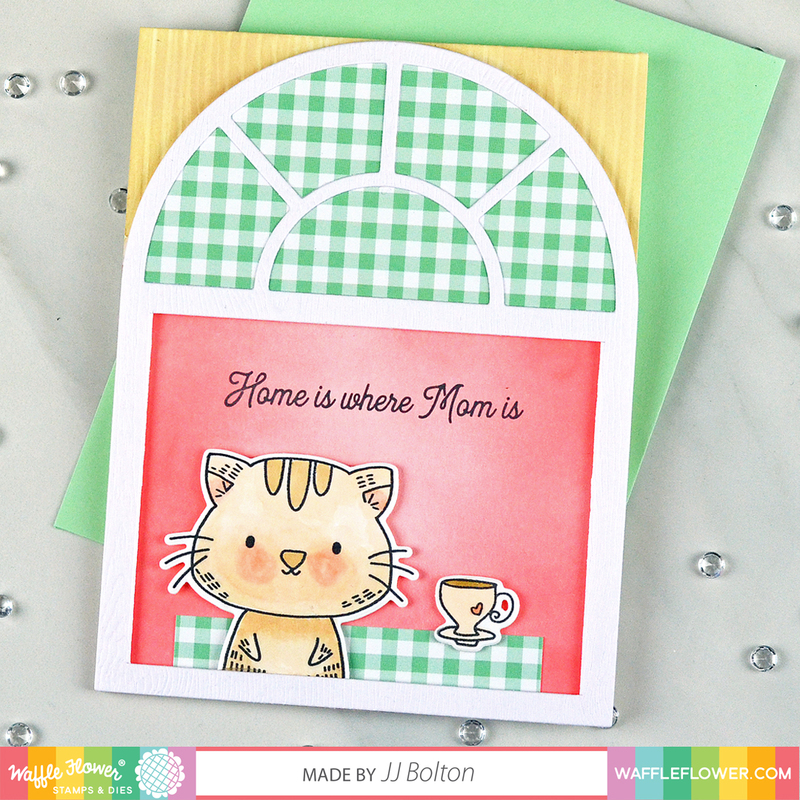 The Tile Panel die has a built-in strip, so there's no guessing where to put a sentiment. 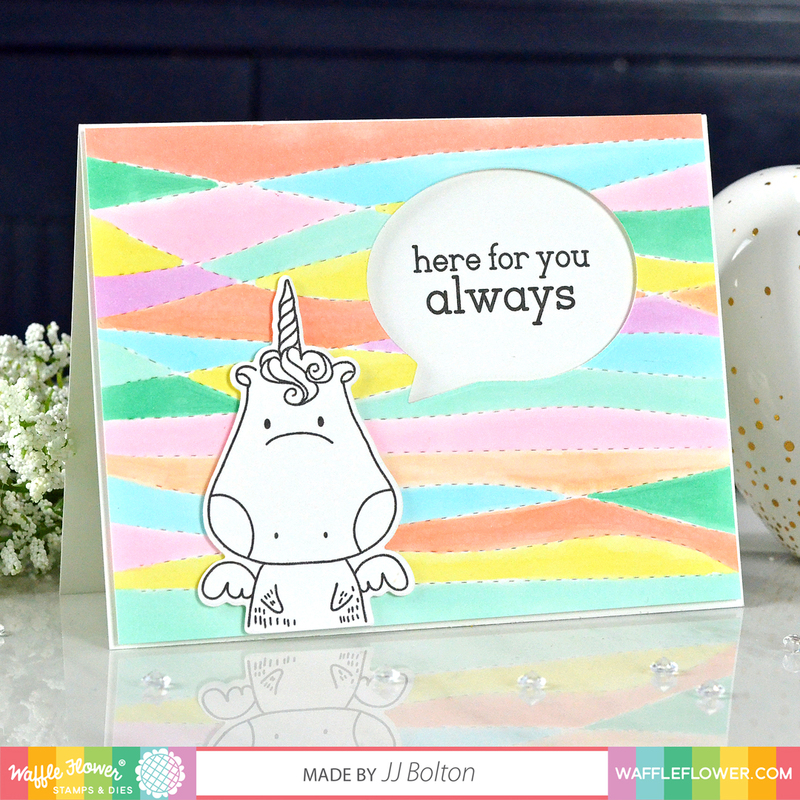 Many of the sentiments from the Here for You set work perfectly with this die, but I'm sure you already have tons of sentiments in your stash that would work just as well. Around the edge of the die is a subtle stitch pattern that just gives that finished feeling. I've been using this die a bunch lately because it really does work with feminine or masculine elements. I used one of my favorite sentiments from the Here for You set on this one. I chose a classic font for this set so that it can be used for any recipient. With my next cards, I wanted to show two different looks you can achieve with the Painted Landscape die. 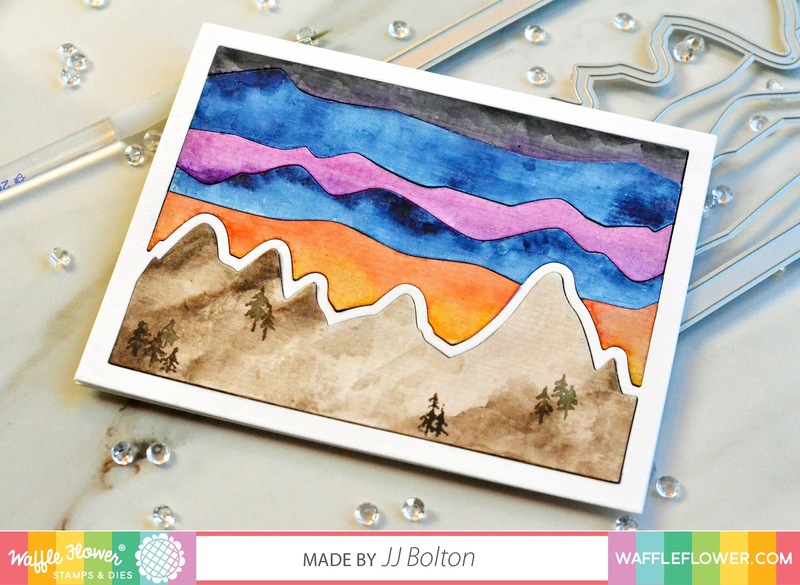 To achieve a clean, graphic look, I used solid cardstock to create the look of a desert mountain landscape. For a more muted, textured look, I watercolored the die cut pieces individually and then inlaid them back together. I added some super easy hand-painted trees along the mountain range for more detail. With this die, everything has a layered look but it's all one layer. 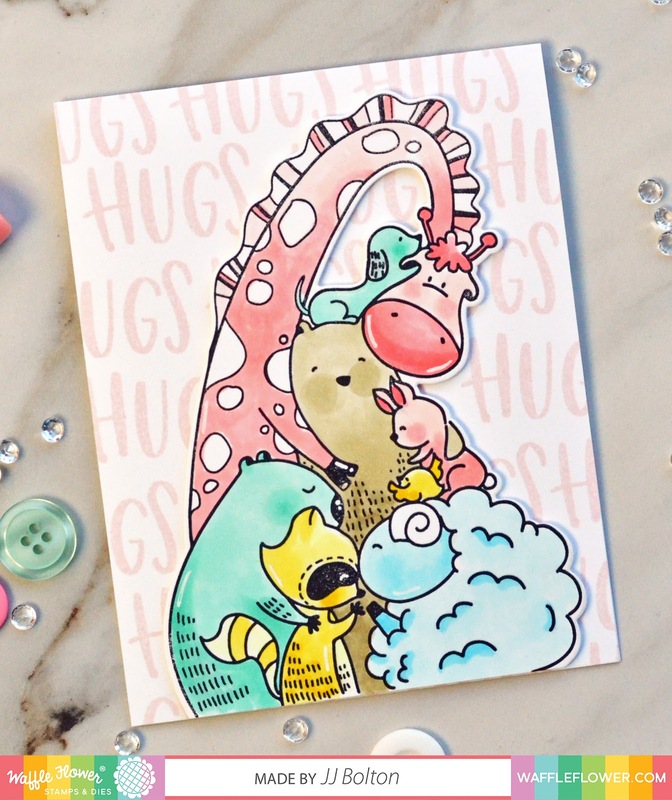 Before I go, I have one more card to share using the Group Hug set by Big Bear & Bird. Who doesn't love that bear? I used copics to color the image, die cut it, and placed it over my stamped background. That's it for me! Thank you so much for hopping with us! I'm the last one in the hop, but if you just jumped in, here's the list of everyone hopping today! Did you miss any? To celebrate the blog hop, Waffle Flower is giving away $25 gift certificates to THREE lucky winners. Please leave a comment on my blog and along the hop by 11:59 pm ET on 1/7/2019 for chances to win. 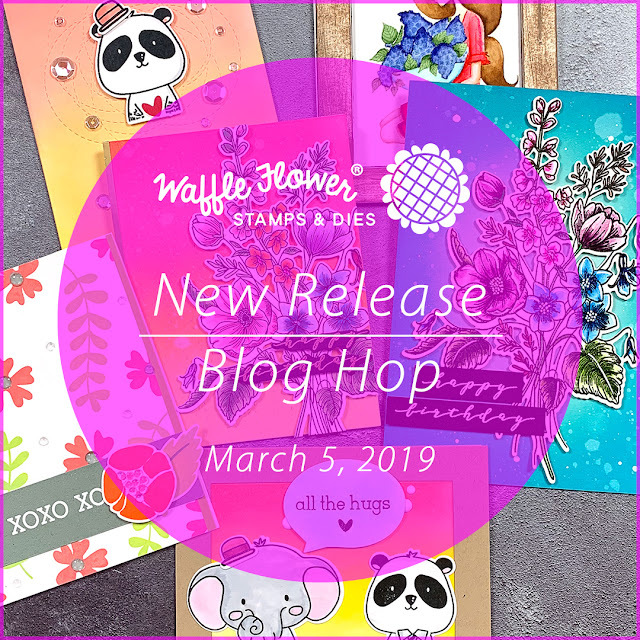 Winners will be chosen at random from the comments left on any of the posts on this blog hop and will be announced on the Waffle Flower blog on 1/9/2019. Plus, orders of $50 or more will get a FREE set of Up & Running Enamel Dots (limited one per customer, while supplies last, valid through midnight 1/7/2019). With the New Year comes a new announcement from me! 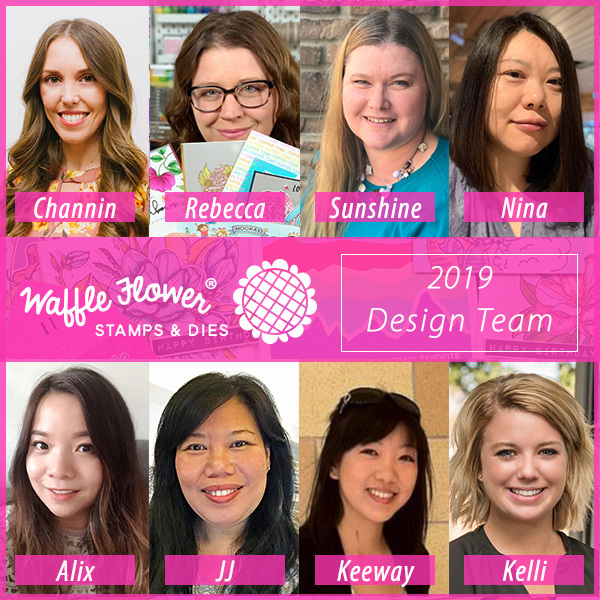 I'm super excited to say that I'm joining the Waffle Flower Crafts Design Team! I am fortunate to have met Nina in 2012, and from the beginning, we were fast friends! At first, I just knew her by her fun and creative cards, but then I got to know the warm and generous person behind the cards. I was so happy for her when she started Waffle Flower and have been one of her biggest fans! So it makes it even sweeter to be a part of Waffle Flower and their wonderful team. Speaking of team, have you seen the team? Wowsa! These ladies do not mess around:) I can't wait to see what they will create this year! And I can't wait to show you all the fantastic stuff that's coming out (it's really cool, really!). Good morning! How's this Monday treating you so far? This is Thanksgiving week for us in the US, but instead of getting ready for Thanksgiving like I should be, I'm still working on my holiday cards:) For today's card, I used two newish sets from My Favorite Things, Sweet Holiday Penguins and Hand-lettered Holiday Greetings. Love, love, love the penguin stamps designed by Stacey Yacula! I couldn't choose a favorite penguin, so I used them all in my card and colored them with Copics in fun pastels colors. I used the MFT Stitched Circle Frames to make a quick shaker for the sentiment. This card is number 14 towards my goal of 50 by December 1! I got a few more done this weekend, so I'll post them soon. I'm approaching 20 now! Woohoo!